Reading the death warrant to Wirz on the scaffold in Washington, D.C.
On the morning of November 10, 1865, Henry Wirz rose in his cell at the Old Capitol and wrote a last letter to his wife. 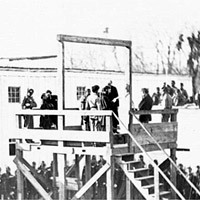 The former commander of the infamous Confederate prison at Andersonville, Georgia, was to be hanged that day in Washington, D.C. When Swiss-born Wirz was arrested on May 7, 1865, at the end of the Civil War, he was the only remaining member of the Confederate staff at the prison, so in the eyes of his enemies, he represented them all.